Damian Yanessa - "Cube III"
This installation is the final piece in a series that is symbolic to how the cube shape is a basic building block within art and science. In that regard, this cubes structure illuminates a hyperboloid within its interior space, creating a composition that represents the ever-expanding and infinite space at the root of both our natural and scientific existence. 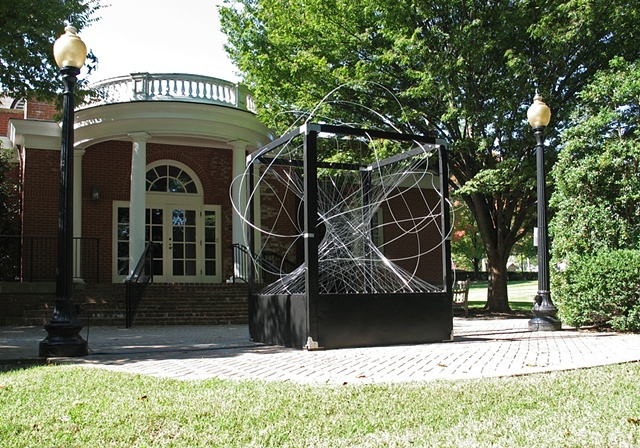 Designed specifically for the University of Mary Washington Campus the installation attempts to establish a strong center within the architecture of the Galleries courtyard through elements of movement and illumination.